It’s been widely reported that Google CEO Eric Schmidt made a recent trip to North Korea. It’s also been widely wondered why. North Korea seems like the last place in the world for an Internet mogul to get much accomplished. Schmidt’s trip aimed to persuade the government to open up the Internet to its citizens, according to an article in PC Magazine. It’s likely his trip had some positive effects in that direction, but there aren’t yet any signs that North Korea is revolutionizing its Internet policy. One of Sophie’s most obvious impressions was that North Korea in January is cold. We expect outside temperatures to be cold in North Korea; cold air masses coming down from Siberia mean that average temperatures in January are around 18 degrees Fahrenheit. But temperatures inside, she said, weren’t much better. Lack of heating meant heavy coats and below-freezing temperatures indoors. The energy scarcity is apparent even in Pyongyang, even when important people visit. Sophie also noted that the power went out during a subway ride; the other commuters in the station all calmly pulled out flashlights and went on their way. 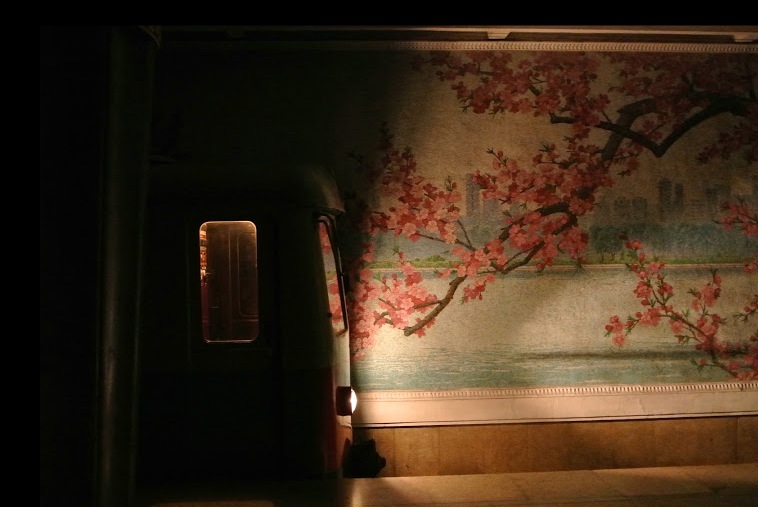 Power outage in a Pyongyang metro. Photo credit Sophie Schmidt. You might imagine that heating would be even worse in the countryside (where electricity is even rarer), but apparently people in the countryside are usually warmer than their counterparts in the cities. NKNews.org’s Jae-young reports that families in her rural town used wood to heat their homes. Because wood was much cheaper than coal and more reliable than electricity, she was always warmer at home than when she visited relatives in the cities who had no access to wood. The cold aside, Sophie also reported on the country’s technology, which was the main reason her father had made the trip. The delegation was shown North Korea’s latest gadgets, including an Android-enabled tablet, virtual-reality software, a video chat platform, and musical composition software. Sophie found the engineers, despite living in such a technologically isolated country, surprisingly knowledgeable. Among other things, they asked Schmidt when the next version of Android was coming out; presumably they wanted their tablet to be as up-to-date as they could make it. Sophie makes the point that it’s not at all clear what kind of market there would be for such a device; certainly no ordinary citizens of North Korea would be able to afford it. Even if they could, there wouldn’t be much point in using it until the Internet is more accessible. Still, the tablet does represent a surprising degree of technological sophistication. The engineers also asked Schmidt how they might offer their apps through the Android marketplace. That surprised me, to hear that North Korea is building apps. Schmidt told them that international sanctions make it impossible at the moment, and I’m sure the country’s recent missile launches and nuclear tests won’t make it likely to happen soon. You can read more about her trip, and see the many pictures she took, on her blog: Sophie in North Korea.